The Japanese word シャキシャキ (ShakiShaki) can be translated as “crispy” when talking about food, but can also be used to describe people. Maybe the right translation would be Energetic, but I actually like the connotation of crispy for personality as well. Not a word I use, but Japanese love using onomatopoeia which sometimes is unclear to me. A few days ago I went to a wine bar for dinner, and a couple on their first date were sitting next to me at the counter. Both seemed in their late 20s or early 30s, both dressed well, would even say more fashionable than the average. Guy drinking Sangria (?! ), girl drinking wine. Girl was the quiet type, answering questions; the guy leading the conversation asking questions while she is answering in a quiet voice and sometimes vague answers. And then, when I was about to leave the restaurant, the guy changed conversation to her previous boyfriends. Honesty, don’t know how dates are done in Japan, but seemed too aggressive to me. Girl answered as always, with a vague, unclear, uncertain voice. And here we connect to シャキシャキ. The guy suddenly said that her character and behavior were not what he expected from their correspondence before the date. That he thought she was シャキシャキ , but she is not. At this point, the girl went even more silent asking if that is bad. To which he answered , “no, but different from my expectation”. How I wish I could finish the story. What happened next? Did the date end in that note or did they enjoy the rest of the night and maybe decide on a second date? Anyways, people sometimes have different personality when writing on SNS and instant messaging, being シャキシャキ. Energetic and strong, while different when meeting face to face. His new book AX is in the best selling list, so I thought I might as well try reading Japanese suspense books. Started with Grasshopper (グラスホッパー）　which tells the story of Suzuki, Semi (蝉, Cicada) and Kujira (鯨, Whale). Kujira kills people by “convincing” them to commit suicide, Semi kills people with a knife and Suzuki entered this world to avenge the murder of his wife. A new hype which was shown on TV and now accompanies with ads in the train is a Study book for children. How to motivate kids to study the Chinese Characters, Kanji? Obviously うんこ, feces, bowel movement, or whatever you want to call it. https://unkokanji.com/ is the website which promotes the books and has several examples of sentences to remember the Kanji. Recently watched an NHK documentary about Donald Keene . Putting aside the usual Japanese dramatisation of his story, I was really moved by the person, his efforts and translations. What really interested me is his translation of Japanese literature and conversations with the writers. I struggle reading Dazai Osamu and Kawabata Yasunari books, which is not only about the Japanese language, but also the Japanese culture. Hope it will not take me long to be able to read Japanese classics. 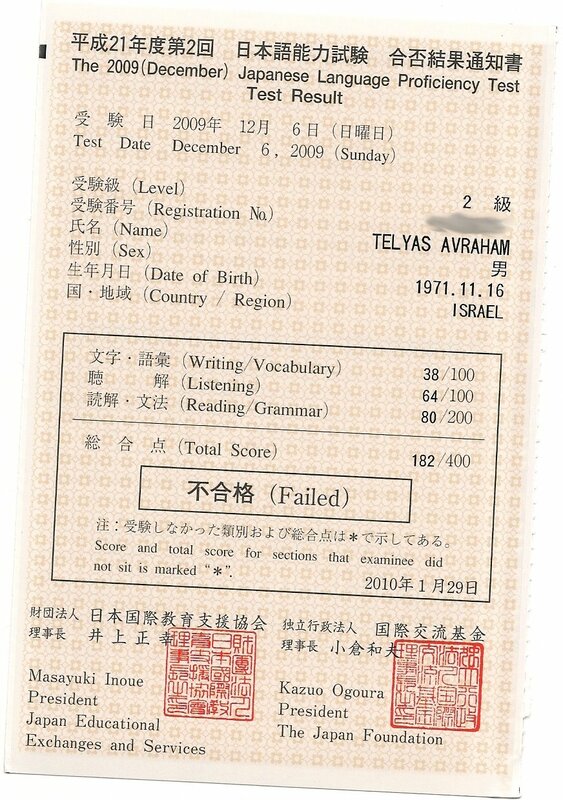 I failed JLPT Level 2 test. Now, it may seem something that one would not want to share on a blog or brag about. But, the thing is, I DID NOT STUDY AT ALL for the test. In the 9 months since I arrived to Japan I attended maybe 20 hours of formal Japanese lessons. Considering the above, the results I got are quite impressive.